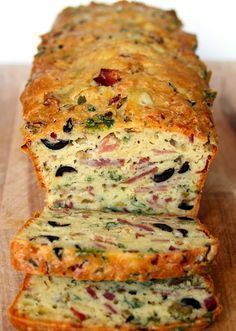 OMG, Olive, Bacon and Cheese Bread! Are you looking for a quick lunch fix at work? Or simply a good dish everyone will love at home for dinner? Serve this olive, bacon, ham and cheese quick bread with few crisp salad leaves. No cooking skills required. Easy to do! This delicious bread would make a good party appetizer too — you could even make this in mini muffin pans. Of course, you a free to explore all of the many ways to serve this forbidden delight. Anyway, just make it and grab a slice for a quick lunch on the go! 7 ounces (200g) city ham, already cooked — sold as “ready to serve”. Still on the bone, it’s better! If you don’t want to bring back the whole ham at home, ask your butcher to slice it off for you. 1. In a large bowl, whisk together the wine, oil, eggs and salt. 2. Separately, mix the flour and baking powder, sift and stir into the liquid preparation. 3. Chop the onion finely and melt in a skillet with a bit of olive oil (or butter). 4. Add the bacon to onions and cook for a few minutes then keep aside. Take care of draining the mixture to avoid a soggy dough. 5. Slice the olives and parsley and cut the ham. 6. Add all ingredients and grated cheese to the basic preparation and mix. 7. Pour into a buttered loaf pan, 9 by 5 inches. 8. Bake in the oven for 1 hour at 360°F (180°C). 0 Response to "Olive, Bacon and Cheese Bread"